My spinning class last Saturday was incredibly exciting, intense and frustrating all at the same time. It's been a long time since I've been so challenged with learning a new skill. I'm so glad I did it though. I came home thinking about getting a wheel and have been doing internet research all week. It's even keeping me up at night! The last thing I need is a new hobby, but I've wanted to do this for years. I spent the days before the class trying out my hand spindle which I've had for 2 years. I made one long strand of singles and took it with me. My teacher showed me how to ply it on the wheel. 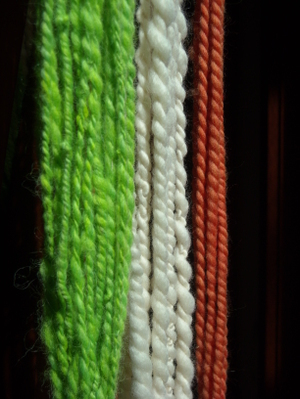 That's the green one up there made with Romney roving I got at Black Sheep Gathering two years ago. After plying the green she showed me how to spin with the orange pencil roving. It was so easy! 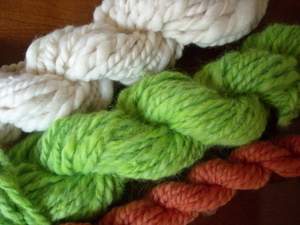 The pencil roving is a breeze to use because there's little to no drafting involved. See how evenly spun it is. Lastly I spun the white roving and, man, was that a challenge. 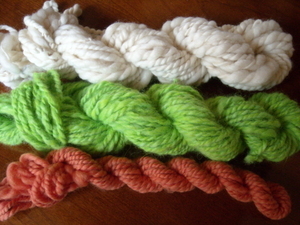 It has the inevitable lumpy/bumpy, thick/thin look of yarn made by beginning spinners everywhere. By the time my two hours were done I was exhausted and really needed a break. I spent a bit of time outside the store talking to a mom and her daughters who were there to spin in the sunshine. The store sells yarn on commission and they were creating the most beautiful yarns. 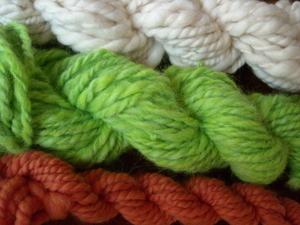 It seemed the whole family had started spinning only recently and they were already making yarns nice enough to sell. I hope the learning curve is like that for me too! The mom had a Lendrum folding wheel and that's the one that I've got my eye on. I really need to try one before buying so I'm going to do that when we're in Portland in a few weeks. This year's Black Sheep Gathering is on the horizon in June and I hope to be able to make it there for a day.